Are the short winter days starting to get to you ? Maybe it is time to have some fun ... and what better destination than the sunny parts of Mexico ... Escape, relax and come back rejuvenated. One week from March 17 to 24 - for experienced riders. 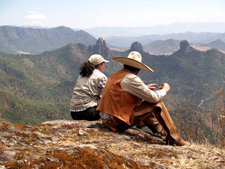 The Highlands Explorer Ride is just one of many fantastic riding tours in Mexico. 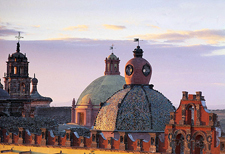 Have a look at our Mexico Pages ... truly some of the best rides anywhere. Mexico makes you feel alive - the colors, the vibrancy, the friendly, welcoming people, the great hospitality, the superb cuisine, the great shopping, 1000s of years of history and culture and frankly, the good, old-fashioned values that make a place irresistible and unforgettable. 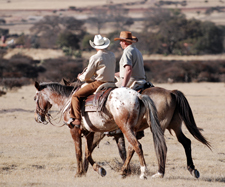 Due to its reliable weather, it offers year-round horse riding opportunities! 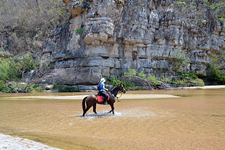 Mexican horse riding holidays combine the best Mexican culture, landscapes and cuisine with some excellent ranch style rides. Forget about the media stories you may hear ... all of these rides are located in perfectly save parts of Mexico. Gallop across open grassland, canter through beautiful woods, ride through small villages and at the end of each day relax in one the many superb fincas and haciendas - check out the Colonial Villages Ride to San Miguel de Allendes. Other progressive riding tours are organized in a big circle ride, where the horses stay out on the trail, but you return to your comfortable finca at night, making it a relaxing and exciting trip at the same time. Explore the green mountain valley of Valle de Bravo and see the spectacular Monarch Butterfly sanctuary or come and ride across the highlands in Central Mexico - and enjoy a Jacuzzi or swim in the pool at night - or some yoga in the morning. The newest adventure is a spectacular ride in the southern part of the country - in the state of Chiapas. Explore mountains, canyons and canter on the beach. Whatever you choose, you’ll find riding in Mexico spectacular. Your Mexico expert and riding holiday organizer with trips all over the world is Hidden Trails. If you prefer to save your holidays for the summer ... make sure not to book too late .. several trips are already starting to be full. For all of you that are on Facebook - an easy way to follow us with new Specail Offers, new Slide Shows or Videos ... become a fan of our "Facebook Page" - we already have over to 12.500 followers! Now is the time to secure your best space for 2012! Special Group Offers are online. They are about galloping on endless beaches, forging rivers, cantering through forests, trotting along age-old trails, gazing at beautiful vistas, and encountering foreign cultures. Most of all, these trips are about getting away from the cycle of work and never enough free time. Escape from the rituals, which long ago froze our nights and days into little more then routine, because deep inside we all feel the longing of the nomads, whose lives we lived thousands of years ago.